In late October, DeWALT invited six special guests to its headquarters in Towson, Maryland, to spend the day building Adirondack chairs with employees, having lunch and touring DeWALT’s Industrial Design Unit at Stanley Black & Decker University. These guests weren’t celebrities, business leaders or members of the press. They were military veterans and alumni of the Wounded Warrior Project (WWP). It’s a national outreach organization dedicated to raising awareness and enlisting the public’s aid for the needs of injured service members. Aside from the goal of just having fun that day, DeWALT’s team-building event also had a broader purpose of recognizing the company’s increasing commitment to the needs of veterans. That’s been a special mission of the “Guaranteed Tough”® brand in 2013. Incidentally, Wounded Warrior Project is also recognizing its tenth anniversary this year, reflecting on a decade of service and reaffirming its commitment to serving wounded warriors for their lifetime. Howland says that on a corporate level, partnering with Wounded Warrior Project is a fitting part of Stanley Black & Decker’s Citizenship program of outreach. It addresses six issues that Stanley Black & Decker sees as critical action areas in our communities: affordable housing; Science, Technology, Engineering and Math (STEM) education; veterans’ affairs, children’s healthcare, disaster relief and community support. But within the DeWALT organization, the concern for veterans also has a great deal of personal significance. Close to 400 employees are either veterans or current active duty members of the U.S. military. Within that rank and file, over the past few years, some employees have been encouraging management to take a closer look at the mission and core values of the Wounded Warrior Project organization, and then deepen DeWALT’s partnership with WWP even further. Those efforts helped prompt DeWALT and representatives from WWP to meet several times during 2012, “and we became thoroughly convinced of their (WWP’s) ability to make an impact for veterans in a way that very few similar organizations can,” Howland says. “Our core values are the same,” he adds. So DeWALT posed a bold challenge to itself: raise and donate a minimum of $250,000 to Wounded Warrior Project in 2013. That’s no small contribution, by most anyone’s standards, and Wounded Warrior Project is one of many charities, including Habitat for Humanity, United Way, ToolBank USA and others, that DeWALT already supports. So, it was determined that there would be some need and opportunity for customer participation, too, to help DeWALT reach its Wounded Warrior Project financial goal for this year. To that end, this past fall DeWALT launched nine limited-edition Wounded Warrior Project co-branded tools. They included three 20V MAX* compact tools (a drill/driver, hammer drill and impact driver), a 12V* MAX Lithium-ion Combo Kit (impact driver and drill/driver), screwdriving and drilling/drive accessory sets, a 25-ft. tape measure, MIG weld framing hammer and a 24-in. tool box. The limited-edition tools are easy to distinguish from other DeWALT tools: they have a specially designed digital camo pattern with Wounded Warrior Project logo. On the cordless tools and combo kit, there’s a belt clip bearing a WWP insignia. Five percent of the purchase price from these special co-branded products is being donated to Wounded Warrior. DeWALT also held special Wounded Warrior Project customer events during October and November at some 150 participating Lowe’s® stores nationwide. Those events included screw-driving competitions, product demonstrations and giveaways, donation drives and more, depending on the store. “There was tremendous end user turnout and support at these events,” Jon says, “and to further show our support of this great organization, we donated 10 percent of event day sales on any DeWALT product to Wounded Warrior Project.” That amounted to another incremental $35,000 toward the donation goal. Some of the DeWALT-Wounded-Warrior Project products are still available at Lowe’s and other leading retailers. Howland says that in 2014, there will continue to be DeWALT-WWP branded tools and more customer events, too, but DeWALT is still in the planning stages for 2014. Details are yet to be determined. The six Wounded Warrior Alumni and their DeWALT sponsors certainly had a chance to make good use of the co-branded products during October’s Chair Build event. 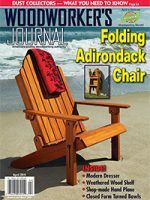 In teams of two or three, a veteran guest and several teammates from DeWALT assembled Adirondack chairs made of African mahogany. Howland says the six guests were identified and selected by Wounded Warrior Project’s alumni manager, based on who WWP felt would enjoy the experience and benefit most from it. WWP maintains close, one-to-one relationships with its alumni veterans, and that helped facilitate the selection process. DeWALT’s Chair Build event also satisfied a WWP goal of finding unique experiences where warriors can interact with each other. “These kinds of team-building events … can mean a lot more to wounded service members, and they can have a direct impact on their road to recovery,” Howland says. At the end of the day, each guest left the University with his chair as a parting gift, plus the DeWALT-WWP tools he used to make it and a selection of other Black & Decker and Stanley home and outdoor tools. And now as 2013 draws to a close, Jon is pleased with DeWALT’s invigorated partnership with WWP and the efforts that have been made on behalf of veterans this year. He’s also gratified by the generosity and support shown by DeWALT customers. To date, the company has more than met its $250,000 goal — in fact, nearly doubled it: proceeds from the special edition DEWALT-WWP branded tools and other incremental donations from DEWALT total $493,000. Howland anticipates that the final 2013 donation check will be presented to Wounded Warrior Project some time during the first quarter of 2014.